A gorgeous cedar home nestled in over four acres of dunes and sea grass on the ocean on Oregon's north coast. Floor to ceiling windows flood all the rooms with light. The house is fully furnished with comfortable furniture and antiques. Large rooms accommodate many activities and the deck awaits your lounging and meals. Walk steps through a path on our private property to the beautiful beach; play croquet in the yard or fix dinner on the BBQ or s'mores in the fire place. Located in a gated community (recently acclaimed as one of the 10 best in the country), half way between Seaside and Astoria, there are roads for riding, trails for hiking and history to explore. Nearby Astoria, Seaside and Cannon Beach offer theater, art and cooking schools. History museums and Lewis & Clark sites dot the area. Credit card accepted through HomeAway: The house was remodeled in the winter of 2010 and is even more wonderful. Both bathrooms were completely remodeled with new high-end fixtures and floor and wall treatments. The kitchen has granite counters, tile floors and top quality appliances. We installed a gas furnace, fireplace and on-demand water heater and an outdoor shower. The yard can accommodate badminton and croquet as well as providing a wonderful play space for children while adults relax on the deck and new flagstone patio. The outdoor shower cleans kids and dogs. Free wifi. Charlie and I are semi-retired: he is a playwright and director and I was Head of a private elementary school. We are enjoying this phase of our lives with time for family, travel, and entertaining. I have always loved the beach and the peaceful days, beautiful night skies and the quiet. I wanted a house on the oceanfront, but desired privacy and protection from the wind, This house has everything I desired - nestled in the dunes and sea grass but only two minutes down my own path to the beach for those long walks, watching the pelicans and enjoying the changing sea. Both bathrooms have been remodeled with all new fixtures, beautiful cut rock floors and tiled walls. The house is nestled into the dunes and sea grass on over four acres of beachfront. Our private path will take you to the sand in minutes. Smoking only allowed outside. Pets considered with pet rules. Stairs require some mobility. The entire family enjoyed our time at this very private well appointed house. Thanks for sharing your house with us. We had such a restful time and OH the Elk!!!! Wonderful location, super perfect for people with dogs! House has all these little awesome touches like heated floors, updated kitchen and bathrooms, awesome towels, linens on the beds ANDDDDD super comfy beds! We’ve stayed at a few vacation rentals where they don’t have good beds and a crappy night sleep really ruins a trip. So we’re very thankful for that! I am so glad you had a good weekend and I look forward to having you be a guest again. My wife and I enjoyed our stay very much. House location is great for beach access, nice up to date amenities. Just a great place to go. Will visit again. Thank you. I am delighted you enjoyed your stay. I try to have the home feel just as I would like to find it. I look forward to your return stay. Our week at Surf Pines could not have been better, the weather cooperated with us for the most part, the house was exactly as described...beach was fantastic, our dogs loved every minute of it!!! I am delighted you enjoyed your time at the beach house and hope you will return again. House is as advertised and great location. We were 10 miles either way to stores and shopping if needed. Nice easy walk to the beach and our dogs loved the walk and beach. Adding bonus is the ability to drive on that beach. The second morning there a herd of elk walked through the backyard. Saw deer daily and even had an eagle on the beach marker post! 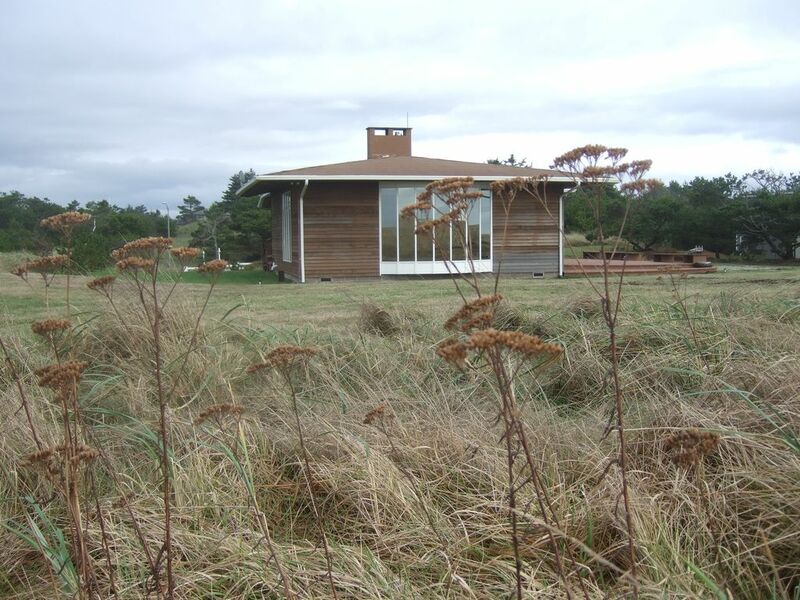 The Dunes House is located on more than four acres in the beautiful dunes and sea grass of the northern Oregon coast. You are surrounded by wildlife and beautiful night-time skies and yet just minutes from hiking, art, museums and good restaurants. Astoria has museums, art, a working seaport and history for you to explore. Within miles you can find live theater, art, fun shopping and cooking classes. Or stay close to home and walk the miles of beaches just down our private path. Rates are for maximum of six persons. Additional persons are $30. per night per person.